Rust car, clean car, itty-bitty green car. 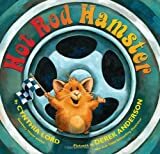 Newbery Honor-author Cynthia Lord and New York Times bestselling illustrator Derek Anderson put the pedal to the metal in this endearing, rhythmic, rip-roaring race to the finish line where a hamster creates a sizzling hot rod with a little help from his new furry friends and YOU! I love this book! It is a fun book and I love that you get to choose your car and accessories with the main characters. If you are not that good at reading this book is for you you will love it. It's about a hamster who wants to be in a race. He picks his wheels design and everything. All the other animals laugh and make bad jokes about him because he is short. He ends up winning the race.